Michael Sullivan (1916-2013) witnessed and studied the biggest single transition in Chinese art in the 20th century, in which the East engaged with the West. The artist of this painting, Wu Guanzhong (1919-2010) was a leading figure in this transition, able to move easily between Chinese and Western media and express a wide range of ideas and feelings in his paintings. 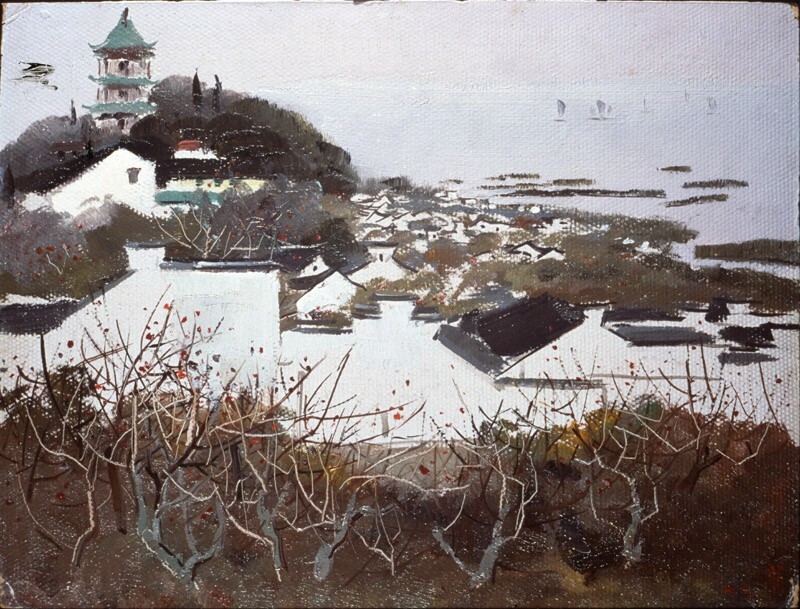 Wu studied from 1937 to 1942 in the Hangzhou Academy under Pan Tianshou (1897-1971) and Lin Fengmian (1900-1991) and from 1947 to 1950 in the École nationale supérieure des Beaux-Arts in Paris. He created a new, contemporary style of ink painting that captures the beauty of villages in the Jiangnan region with striking simplicity. Wu’s oil landscapes, though less experimental than his ink painting, are lyrical and light in touch, combining echoes of Maurice Utrillo (1883-1955) and Raoul Dufy (1877-1953) with a Chinese sense of space. This landscape scene was painted in 1973 and given by the artist to Khoan (1919-2003) and Michael in 1980.